This week’s squees are concentrated into a bullet-point list. Right now, I don’t want to leave my desk, so this is hard. Besides my e-mail and word count, the temperature is dropping rapidly and darkness is always a good place to be in order to write, write, write. However? Life, the universe, and everythingTM is calling me to ensure that yep, there are groceries in the fridge and yes, I should probably do something more strenuous than rolling my chair back today. Before I do, however, I want to get this done. It is often harder in this doom-doom-doom-terror-squared-BE-AFRAID-TO-LEAVE-YOUR-HOUSE age to find something to be happy about, because being happy is not the “popular” thing to do. So here are seven squees. The reason why? I don’t want to flood my blog every day with a new one, because it’s apparent that a list seems more appropriate unless I have Something To SayTM. 1.) Netflix’s First Original Movie is the sequel to Crouching Tiger, Hidden Dragon! Should be out late 2015 or 2016, but I’m curious to see where this goes. It did make me squee! 2.) I love how random conversations can be serendipitous. I was talking about putting together a gothabilly outfit, when someone suggested a fabric site. Spoonflower is an awesome site that features indie fabric print designers. And they have LOADS of skull prints. LOADS! 3.) This Gorey-inspired print from Weregeek. Now framed and on my wall. The poster-sized 11 x 17 frames work perfectly! 4.) I figured out how to do a flat Kumihimo braid using a square disk all by myself. Huzzah! Not finished with the design quite yet, because I think I’m going to go a little crazy with it. I have an idea, though. WOO! 5.) Pre-ordered The Edge of Tomorrow. GREAT movie! 6.) The Tower of Orthanc in Legos. With an Ent! AND A LEGO PALANTIR! 7.) Bat for Lashes and “The Haunted Man.” LOVE this collection. LOVE. Caffeinated Beverages Consumed: Just the one. There will likely be more. In My Ears: Surprisingly? Nothing. Book Last Read: I’m a bad writer because I can’t remember the title at the moment. TERRIBLE EVEN. I owe you two or three posts today, but you’re only going to get the one. The first one was a bit more on the pre-order for Things Don’t Go Smooth and the second was this week’s list of squees. (A third was going to be on how I write long form works, but hey… there’s only so much time in the day.) Instead, I turn to my summary on what happened at Context 27–because it’s fresh in my mind. Having been to more science fiction and fantasy conventions now, I feel that there’s a marked difference between shows and what you can expect from them depending upon what you want to get out of the convention. I talked about this before, but I feel it’s important to note that yes, I do have a touch of social anxiety when it comes to meeting new people. I am terrible with first impressions, partly because I have a very big personality that I realize can/has steamrolled over others, but also because I’m sensitive to the mood of the room or I’m trying to be respectful of what the person I’m talking to is there to do. As I told one of my friends, I see the threads connecting folk, and I never want to feel like I’m imposing. This changes with time, yes, because as I get to make more friends who are comfortable around me it gets easier. (Which I think is true of anyone, really.) BUT, it’s also equally important that I have something to “do.” A media or gaming convention? No problem. But SF&F cons tend to have a slower pace due to their focus, which means I have to get “creative” with my time and make the most out of it while I’m there. Yes, absolutely, I can write or read, but that’s something I can do at home. Context fits into my sweet spot because (though the hotel was probably designed by Loki) there were definitely Things To Do and it had a tight focus. I went in a day early to decompress and not be rushed; meandered over to this lovely place called Pies and Pints where I stamped “approved” on their pulled pork nachos and blueberry cider. Everyone in the general area was extremely friendly and happy to divulge their life’s story, from the Nigerian shuttle driver to the local pottery artist to the budding songwriter. It was lovely. For Day Two, registration began, I got to meet guests-of-honor Jonathan Maberry and Betsy Mitchell who were both fabulous. Then, I had a fun panel about the future of magazines with Brady Allen, crashed my friend Maurice Broaddus‘s workshop on Building Your Brand, had dinner with the amazingly talented Lucy Snyder and a heap of others, and started to get excited. As folks trickled in, I knew the guitars would too–courtesy of Lawrence Connolly, John Hornor Jacobs, and Geoffrey Girard. So we spent later Friday night in an impromptu jam, and it was a-w-e-s-o-m-e. I hope that this’ll become a regular thing, as there are loads of great musicians floating around! Sunday I slept in a touch, got to make my good-byes, and scrambled for the way home. Now, I am SURE I am missing something. Positive, even. (I’m also certain I am missing more someones, too… DARN IT ALL and HUGE apologies in advance!) But here’s the thing: the reason why I feel that this show is a good one to attend, is simply that there’s a strong emphasis on craft. If that’s the type of convention you want to attend? Then mark your calendar for next year’s show! Thanks again to Steven Saus for inviting me! I will be at Context 27 in Ohio this weekend along with the Very Fine Guests and panelists listed at the bottom. Yes, I will be there in Ohio, in both spirit and in flesh with mah skulls on. There will be a reading of my original work, a fantabulous game show about worldbuilding, and may *if it fits in my suitcase* even be a rousing game of Firefly RPG happening. Shenanigans! HUGELY busy getting ready for Context 27 this weekend, so I’m putting together my list of ten squees while rocking it to SOAD (System of a Down). In no particular order… Here’s days 19/365 through 28/365! 1) A Clean Office: I now have art up on the walls! HUZZAH! And, a pile o’ boxes to unpack yet. Boo. But? It’s very, very good start! 2) Kirigami: One of the pieces that I put up in the kinda-but-not-really-forest-of-skulls bathroom is a piece by a Chinese artist of a raven. Kirigami is the art of cutting paper; you can find out more by visiting the Origami resources website. 3) Soundwave! : Picture hung up, and my Soundwave model is at the ready. YAY! 4) Fall: Okay, I may be the only person in the universe who’s not a fan of pumpkin spice everything. Like bananas, I like mine real thank you. I LOVE Fall, though. And? I do have something pumpkin spice I can try–pumpkin spice curry! 5) No Disassemble, NO! : I take great pleasure in assembling furniture. For the first time ever–we now have an entertainment cabinet. Woo! 7)The “Extended” Versions of Films: It is now official. The extended version of films are often better and more detailed than the shorter versions. Such a HUGE difference extra content makes for movies like Snow White and the Huntsman, The Abyss, The Lord of the Rings films, and more! 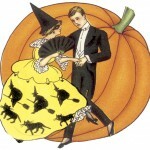 8) Halloween Decorations: Because it’s the one time out of the year that I can find the things I want to decorate my house with. 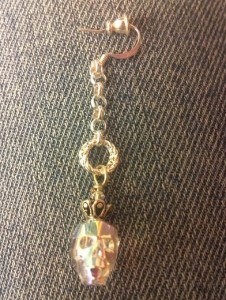 9) Sugar Skull designs: The design of the sugar skull has now made its way into the mainstream. I like the colorful designs and found a decoupage skull I can decorate. Already bursting with ideas! Still, I want to point out that The Day of the Dead is part of Mexican culture. I love the art, but I think it’s important to recognize where this comes from. 10) Maneki Neko: Maneki Neko are Japanese good luck charms always make me squee. Love the lucky cat and glad I found one to hang up! Caffeinated Beverages Consumed: On my second cup of joe. Rinse, repeat. Work-Out Minutes Logged Yesterday: More housework. Ugh. In My Ears: My cat is yelling at me. Whaaaaa? 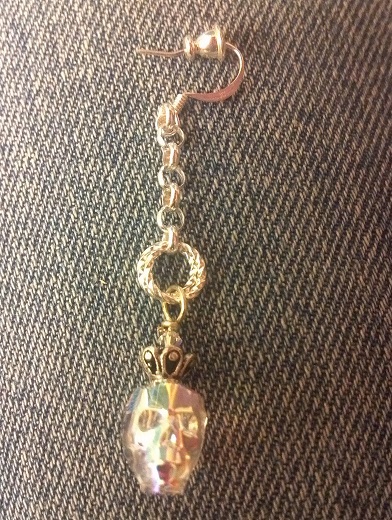 Latest Artistic Project: Skull earrings. Latest Fiction/Comic Release: Last Man Zombie Standing. See also: need to write more flipping comics and exercise my art skillz again. Feh. I’m a few days behind on my squees, but there’s a good reason for that. I took a *much* needed break this weekend to clean my humble abode, do a little organizing, and start hanging art up on the walls. Took some time out to play around with these crystal skull beads I picked up from Fusion Beads, and came up with a design. By flipping a bead cap upside down, I turned it into a crown. I’ve found that the holes are too big for regular bead embroidery and the 3D aspect of the bead lends itself to certain designs. I’ve got an idea for a wirework project, but even this pair swings a bit. They’re brilliant, though! I wish Swarovski would make flat beads of these for bead embroidery! Caffeinated Beverages Consumed: On my second cup of joe. Work-Out Minutes Logged Yesterday: A bazillion trillion stairs. In My Ears: Water fountain. Latest Artistic Project: You’re looking at it!